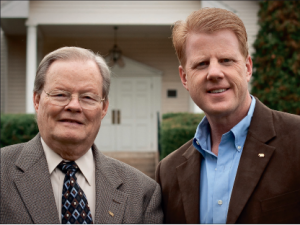 Dr. Harold Willmington has spent half of his life at Liberty University. Turning 80 this week, Willmington has been with Liberty since the second year after its inception and his impact on the university has inspired many students over the years. Willmington is a man of many occupations, including pastor, author, teacher, dean and visiting professor, according to his biographical information. His work as an author began many years prior to the release of his first book—before he had considered writing a book. “I decided when I entered the ministry that I really needed to be able to think my way through the Bible,” Willmington said. To learn more about the Word of God, he gathered 66 sheets of paper and dedicated one to each book of the Bible. On each page he wrote everything that he thought that he, as a pastor, needed to know about each specific book. After finishing the Bible, he created 12 sheets of paper dedicated to the great doctrines, according to Willmington. “When I finished, I had 78 pages of world famous information,” Willmington said. What became the basis for “Willmington’s Guide to the Bible” was taken from those sheets. This book discusses “finger tip facts” such as angels, Satan and the Holy Spirit, according to Willmington. In February 1972, Dr. Jerry Falwell canceled a week of classes so that students could listen to Willmington teach about the life of Christ. This was his first visit to the campus, according to Willmington. He was offered a position at the school which he initially declined upon his belief that he was called to be a preacher. It took him between three and four months of praying to determine that this was the Lord’s calling for his life and not just an opportunity, according to Willmington. “In June (of that year), my wife and I and Matt, my son who is now the associate pastor of ministry development and family ministries at TRBC, and our dog drove down,” Willmington said. During his first few years at Liberty, he was able to begin the Liberty Home Bible Institute, now known as the Willmington School of the Bible. Since 1976, over 102,000 students have signed up to be a part of this institute. These students have come from all 50 states and 40 different countries over the years, according to Willmington. Even amid all of his accomplishments, Willmington does not take credit for how far he has come. He believes that the true hero is his wife, Sue Willmington. Sue Willmington took on the deaf ministries at TRBC in 1972 when their family arrived in Lynchburg. “For years I was known as the husband of the deaf interpreter,” Harold Willmington said. The Willmingtons will have been married for 51 years in the beginning of April. Together they have three grandchildren, Nathan, Carissa and Abigail, all of whom are involved with Liberty University or Liberty Christian Academy in one way or another, according to Harold Willmington. Harold Willmington is always looking for ways to invest in the students of Liberty University. He loves interacting with students and learning more about each one as an individual. His advice to students is that they seek the Lord by not only reading but also heeding the instructions in the Bible. In doing this, students have no reason to worry about their futures. “We don’t know what the future holds, but we know who holds the future,” Harold Willmington said. The impact that he has had on the Liberty community reaches not only students, but faculty as well. Eva Middleton, his administrative assistant, describes him as a humble, kind and generous man with a great sense of humor. I am no one other than a grandmother but once(1995)was a student at LBC. However I still love Dr. Willmington, his wife and his books; even though they don’t know me. I refer often to his amazing books. Every bible student should have them. I own 4 and have given another 2 copies to my children. In my earlier years, before I met Dr. Wilmington and his wife Sue, I attended Liberty thru the school of lifelong learning. I knew about him and took his bible classes thru the video tapes. A few years later, by direction of The Lord, I moved to Lynchburg, joined TRBC and began work at Lynchburg Health and Rehab as the Director of Nursing there. Quite by coincidence, Sue’s mother was my patient and I got to know “Mr. Bible” (my favorite reference for him) and Sue very closely. They are very humble, loving and genuine Christians. They inspired me more than they will ever know. He, Dr. Falwell and Sue made a huge impact on my life. I owe my salvation to them and love them with all my heart. Dear Dr. Wilmington, congratulations from a former student of TRBI(1974-1975)on your eightieth birthday and another year of serving our great God and Savior! Your life and ministry continues to be an inspiration to me and I would like to once again thank you for lifting me up into the heavenlies shortly after I received Christ as Savior and enrolled in TRBI. For the last nine and a half years I have served as the associate pastor of Pinecrest Baptist Church in Mcdonough, GA. Lately, I have been trying to provide a few of our men with answers to basic questions concerning the “received text” verses the “critical text” issue. While these men own King James Bibles, they are far, far, from being Ruckmanites! They are simply, and sincerely, looking for “a good read” on the subject. Something that would offer a historical and technical approach to the subject. I have already explained to them what the received text is and how we got it, as well as the critical text. But I think they’re looking for something that will give them both the plus and negative side of the controversy. If you know of such a book(s), etc., that would bring more clearity to the two opposing positions. I would love to know of it. Thank you for any recommendations you might make on this subject. Most Sincerely, Tom Miller. Since last May, when we signed up for Sky Angel wireless broadcasting, I have faithfully watched Dr. Willmington’s daily half hour teaching program “Great Truths from God’s Word” on the Liberty channel. Well, what a tremendously encouraging and faith growing time this has been for me. I have almost filled a large notebook. It is a wonderful privilege for me, and Dr. Willmington’s humor and his kind demeanor greatly enhance his teaching. Now we’ve learned that Sky Angel is going to close business this month. I am devastated to lose this marvelous resource. So, I will buy his books and if anyone knows if Dr. Harold’s teachings are on tape please let me know. God bless you, Dr. Harold. My husband is hooked on your program, too! Attended Liberty Bible Institute graduated in 1979. After all these years I am now seventy years old and teach a senior men’s class at my church in Anniston AL. I use Dr. Wilmington’s material to teach along with many others. Remembering those days with great appreciation for you..
Nice to know you are still busy for Him. unmiersma@gmail.com Love to hear from you. My husband graduated from liberty university in 1987 and I was wife,mother of 3 while he went to school. Now after 26 yrs I am listening to the BIBLE institute on c d.
Thank you Dr. WILMINGTON FOR serving GOD these many years. You are an inspiration to us all. I had the fortunate opportunity to hear you speak; in a small town (Ruckersville) in Virginia. You came and spoke for 3 nights just a few years ago. You were so patient with an audience of small town Christians Not Bible scholars or Bible students like you are accustom to. Oh how you made the Bible come alive for all of us. You caused us to think of things that we had not thought of before. You spoke for hours each night. I did not have the heart to hold you up each night as their was a line of people wanting to talk to you. But I wanted to take the opportunity to thank you now. Also I would like to know how to get the book you used for that study. I wanted 2 one for myself and my husband and one for our church library. Dr. Harold Wilmington ia a great teacher of Gods Holy Word. I received my Advanced Biblical Studies Diploma March 11, 2016. It was such a wonderful journey to study Gods word with Wilmington at the desk. He is an amazing teacher, author, and leader of Gods word. I feel so blessed to have traveled this in-depth journey & study of the Bible with him as my instructor. God Bless you and your family. I also loved your exciting stories of your experiences and travels. I understand why they call him Mr Bible, he knows it so well and can break it down for the normal student and back it up with scripture. Wow! Is not Jesus a wonderful friend? We are using your guide to the Bible on Wednesday nights at Thomas Terrace Bible Institute. Thank you so much for your labor of love. Happy 85’th Birthday Doc. Liberty University is so honored to have you as one of our teachers. I was so pleased to have had the opportunity to speak with you a year ago. Thank you for your many years of service to our students , and for your faithful witness. The Miracle of Lynchburg and those who dedicated to make it so. Happy belated birthday and many returns of the day. Moses was changing gears at this juncture in his life a few years ago. We pray for many more in your life as well. My coming to Lynchburg was nothing but a miracle. We lived not far from Corrie ten Boom’s home in The Netherlands. I Saw Nazis’ take my dad as well to prison and luckily he escaped. (Miracle # 1). Living outside of Leeuwarden Netherlands our family immigrated to Canada. Many years later from Ontario to Lynchburg. Flat lands to mountains, what a change. Just like Abraham –new country new language– left it all. In three years, did my high school equivalent, 2years of the best bible understanding one could obtain. One year of college level Four. He supplied the finances for my heart’s desire. You were our miracle at TRBI. Little would you know, that this biblical teaching and thoughtful insight and understanding blessed so many. Not because of because of me but you’re dedication and that of Sue? Diane learned a lot about a woman’s role for family and ministry from her. She talked about Sue many times. She considered her a friend even at a distant. We have relied on the character of God and His dedicated teachers who modeled the above so well and with realty and truthfulness. I felt like one of those men on the road to Emmaus who hearts were burning always learn more. Not just the truth of God but more important as you taught us, to get to know the God of the word. Through many loses and -crosses even as I write this letter, still consider Him faithful and continue to trust Him for the our future. Even my son in law who had stage 4 cancer15years ago, is in perfect health today. I said the above to say this—— thank you for your faithfulness, so many of your students’ lives have changed and been enriched because of it. I was there in 76. Ever great full for those three years and consider them life changing. I wasted all my learning on my family, friends and those who I worked with and for. I want to continue to hear that still small voice that can and does change our families, friends, N.A and the far reaches of this world. I have seen this up close. This work you started many years ago continues to reach beyond the borders of Lynchburg. My payer, Lord just a little quicker, Lord, so many still require and need this truth. Thank you and sue, thank you for who you are and not someone or something else. Thank you for being the real deal back then and still today. Still a student. Your books are on my night stand. I go to bed with them and wake up with them. It doesn’t get better than this. I know He will bless you. May you sense that renewed strength in your life today.. In behalf of my momma, I wish you the best on your 85th birthday! My mother (Lucille Sylvia Terry) took the Home Bible Institute course probably in the mid 70’s. She had very little formal education and was self-taught. She never had the courage to submit any of her test papers back to the school even though she studied what must have been the entire offering. You see, she had a very low self-esteem when dealing with “educated” folk (except her children who all earned degrees). But I know for certain that she deeply treasured each article/letter/tape/test with all her heart. After her death, I found hundreds of tapes, notes, and associated material in her prayer closet that had been studied/marked-up/self-tested. I decided to save her collection. Finally, I started playing the various tapes in my car on the way to work. Today, I was listening to the one on the “Doctrine of the Father” and thought I’d send you a kind word to thank you for bringing such joy to momma (and to me). PS: As I “googled” you, I was very glad to find you well and still doing so much for God’s glory. God bless you & yours. Happy 85th birthday Doc – it’s been 41 years since I first sat in your class at T.R.B.I. (1976-1978) as a new Christian. How you made the Bible live! Your love for the Word of God inspired me and still does. I am the man I am today because of my time at T.R.B..I. Those two years were like a two year revival meeting to me. I chose a law enforcement career and now have retired. God uses Christian lawmen and women for His glory. I can’t say thank you enough Doc. I’m borrowing your book “That Manuscript From Outer Space”. I Would like to buy some. One for myself and many to give away. You see, I have 4 grown Grandsons and 3 almost grown Granddaughters. I want to inspire them to read and love the Bible. I’ thinking this book might do that however after finding this ‘site’ and reading that you wrote many books I’m wondering whether there might be another book you might recommend more. I loved your book. I hope I hear back from you. I wanted to contact Dr H L Wilmington, my Professor 2006-14, at LHBI. I do not have his Email Id to send him a direct message. So I pray for him and want to see him. GRACE OF GOD IS SUFFICIENT. Harold, I am Arlene Miller’s daughter from Quincy, IL. Mom passed away a year ago. Just wanted to let you know, we still remember you from Calvary Baptist. I pray for my teacher, Dr H L Wilmington, always. Today I want to hear about him. Will anyone send me a note about his wellbeing now?